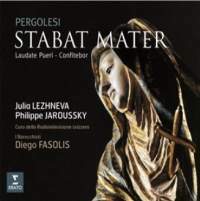 The vast Stabat mater discography offers plenty of outstanding interpretations catering for different tastes. Nevertheless, Julia Lezhneva’s bright-eyed tone and sensitive shapeliness is an ideal counterfoil to Philippe Jaroussky’s limpid sincerity. I Barocchisti’s strings balance the sympathetic phrasing of rhetorical details with the need for the slow music to flourish in an atmosphere of unaffected simplicity. Livelier movements occasionally feature some gutsy exaggerations from the band (the over-done ritornellos in ‘Inflammatus et accensus’), but there is also genteel elegance – if undermined by hurried tempi – in passages such as ‘Sancta Mater, istud agas’ (in which both soloists deliver supremely lovely singing). The conclusion, ‘Quando corpus morietur’, is judged exquisitely. Diego Fasolis masterminds a compelling paradox of tenderness and vividness that confirms why Pergolesi’s deathbed masterpiece retains its fascination. Fasolis’s Swiss-Italian choir has recorded Laudate pueri Dominum and Confitebor tibi, Domine before under the direction of Abbado but Fasolis’s own considerably superior Baroque instincts as a conductor yield notably fresh new benchmarks of these two engagingly extrovert pieces. The choral singing that finishes the doxology in Laudate pueri and opens Confitebor tibi is technically immaculate and thrilling, and a succession of arias are performed with the perfect mingling of zesty devoutness and quasi-operatic intensity (the solemn ‘Sanctum et terribile nomen ejus’ is sung with evangelical authority by Jaroussky). Irrespective of how many good versions of the Stabat mater there are, this is transformed into essential listening by the two less well-known psalms.